Blue, a singer-songwriter, has few options left in the freezing Minneapolis winter until she meets a younger Lakota guy, Eddie, a 25 year-old law school dropout. Blue may have finally found a home in Eddie’s love if his struggle to come to terms with his self-sabotage and confused sexuality doesn’t finally break Blue’s will to survive the winter. Blue, a Navajo singer-songwriter (played by Rhiana Yazzie) wants to open a place in Minneapolis where the Native American community can share music over tea and pie. But the dream isn’t going so well. She pieces a living together by teaching guitar to kids and hosting karaoke at The Moose. Her love life isn’t much better. Her ex, Lucas, spent all her money and beat her up and her even older flame, Ruben, a Baby-boomer and Grammy winner turned real estate agent (played by Chris Trapper of 90s rock band The Push Stars, his music has been featured in There’s Something About Mary and Say It Isn’t So), thinks he owns her. When millennial, Eddie (played by Brian Watson), seems to offer her the love, support, and home she’s always needed, the winter landscape finally becomes the nurturing, artistic homeland she’s been searching for her whole life. But when Eddie’s young auntie (played by Payton Counts) begins to plant doubt in Eddie’s head about Blue’s past and his responsibilities to his family, Eddie begins to struggle again with his self-sabotage and confused sexuality, which may finally break Blue’s will to survive the winter. I’ve been a playwright and theatre-maker my whole life. Originally from Albuquerque, New Mexico, and an enrolled member of the Navajo Nation, I now live in the Twin Cities where I started a Native American focused theatre company, New Native Theatre (NNT). As a scriptwriter, I’ve seen my plays on stages from Alaska to Mexico, including professional regional theaters like LaJolla Playhouse, the Public Theater, and the Oregon Shakespeare Festival. As a producer, I’ve been putting together events since college at the University of Southern California where I produced concerts and lectures by campus visitors like Stephen Hawking, Madeleine Albright, and Herbbie Hancock. I’ve used every skill I’ve learned to be the best artist I can be and now that includes being a filmmaker. Two years ago, I worked on a film called A Stray, filmed in Minneapolis’ Somali community. It premiered at South by Southwest the following spring. After a long career of producing theatre, this seven-person crew inspired me to make plans to direct and act in my own film. 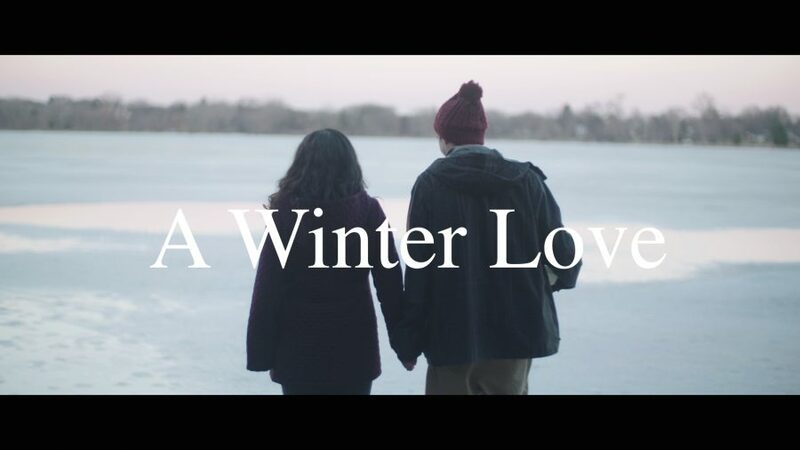 A Winter Love has received positive coverage and has made it to several finals and semifinals of national screenplay contests, so with this inspiration and encouragement, I used savings to hire a crew and film half of A Winter Love last February. I plan to film the second half in January 2018 and immediately go into post-production. My screenplay, A Winter Love, looks at the intimate side of being a modern American Indian woman. Many Native films/media focus on political story lines that detail victimization and are tucked away on reservations. Not many go deep into intimate personal portraits and explore questions of love affairs, family dynamics, and finding a way to create an artistic life. This story doesn’t portray Native identity on the nose, but instead gives a realistic story of two lovers who don’t necessarily “look” or “act” Indian in the way the American eye is used to. But yes, it details their lives informed by their heritage and the Minneapolis world they live in. During A Stray’s premiere at SXSW, I met British Academy of Film and Television Arts award winning, Cinematographer, Ryan Eddleston, who is based in Wales in the UK. My collaboration with Ryan has been a great match artistically, and he has helped me through the learning curve I threw myself into to with a new medium. Ryan Eddleston is known for working with first time British female writer/director/actors like Alice Lowe and Dolly Wells, as well as celebrated directors/producers like Shane Meadows. Because of Ryan, I’ve created a wonderful connection with London based editor, Farrah Drabu cofounder of DNR Films. She has a track record of committing to projects that highlight the marginalized sections of society. Her last feature was ill Manors, directed by Ben Drew, and triple platinum award winning musician Plan B, and starred Riz Ahmed and Ed Skrein. I plan again to hire the same Minneapolis crew for the January 2018 shoot. I’m proud that the crew I hired ended up being primarily people of color and female, including the First Assistant Camera (Hannah Berg) and head G&E position (JC Calybayan). It very much aligns with the equity work that my theatre company engages in and the lifetime of my mentoring and offering opportunities to communities that have historically been marginalized from succeeding in performing/arts career paths. Since February, I, Hannah, and JC have worked with Ryan again in Brooklyn, NY on another feature. To finish A Winter Love and to complete my first major project as a filmmaker, I need financial support. I have been taking odd jobs, teaching classes, and taking on other peoples’ projects to cobble funds together plus a Tiwahe Native Community Foundation grant, to hire the crew for the second half of the shoot, rent gear and production design and art department needs, pay for Ryan Eddleston’s visa, and provide airfare and accommodations for some crew and talent. Funds are still needed for the January filming, post-production such as sound engineering, music licensing, color corrections, ADR, festival submissions, etc. Your donation would allow me to extend the number of shooting days for our January, 2018 shoot, and to create a comprehensive finish for post production. The film is scheduled to be edited and ready for festival submissions by September 2018. The experience of writing/directing/acting/producing a film has given me a feeling of empowerment and learning like none other. Running my theatre company, New Native Theatre, and mentoring other people, has been my number one priority for so long, at times I’ve let my own writing and directing aspirations come in second. But turning my attention to this film is the fulfillment of a lifelong trajectory and life long dream to bring stories about contemporary Native women to life and to bring a story to life that none other than a Native female director/writer could make. Donations given through the FilmNorth website are all tax deductible. A WINTER LOVE is hoping to raise an additional $15,000.